SPEND THOSE GIFT CARDS! They don't improve with age. Nothing I Want. In 2007, Americans lost $4 billion on gift cards that weren't redeemed because "they didn't have anything I wanted." It seems to me that most people buy gift cards that they themselves would like to receive, often with little or no consideration of the recipient's interests. For example, somebody once gave me an $80 gift card from a Berkeley tanning salon. I don't go to tanning salons, so I gave the gift card to a friend. She then gave it to a third person, like the proverbial fruitcake that gets passed around at Christmas. The most useless gift certificate I ever received was for an "aura analysis." 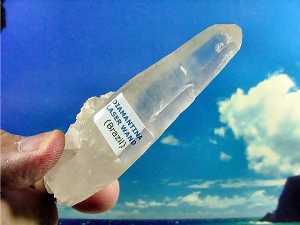 According to the certificate, "a certified clairvoyant, licensed by the Berkeley Psychic Institute, will analyze your aura with laser-wand crystal energy." Anyone who knows me can tell you that I am never going to use this gift certificate! I know a landlord who gives every tenant in his building a Honeybaked Ham gift certificate at Christmas, including tenants who are vegetarians, Jews who keep Kosher, and observant Muslims! Of course this landlord knows that many of these gift certificates will never be redeemed, but he gives one to every tenant anyway because he doesn't want to risk being accused of discrimination. The more specialized a business, the less likely that their gift cards will ever be redeemed. I once owned a stained glass store, and I sold gift certificates there. Less than 1/2 of them were redeemed. Bankruptcy. When a retailer declares bankruptcy, their gift cards usually become worthless overnight. That is because the secured creditors of a bankrupt company, like banks, have to get paid off in full before the unsecured creditors, like gift card holders, get anything at all. 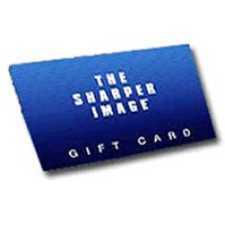 When Sharper Image declared bankruptcy earlier this year, their gift cards became worthless. Consumers were left holding $75 million in useless Sharper Image gift cards. Gift cards from bankrupt Bombay Company and Tower Records are also worthless. When Levitz Furniture declared bankruptcy last year, their gift certificate holders were left holding the bag - again. Since this was the third time in 10 years that Levitz had declared bankruptcy, why do people keep buying their gift certificates? The next big retailer to go may be Circuit City. They are in bad financial shape, and rumors are swirling around Wall Street that they may declare bankruptcy soon. If you have a Circuit City gift card, spend it now. Store closings. Other gift cards are never redeemed because the issuing company left town. For example, you can't use a CompUSA gift card to buy stuff on their web site or by mail. You can only use CompUSA gift cards at their physical retail stores, but CompUSA closed all their stores in California a few months ago. They had a store in Emeryville, 4 miles from my house. I used to shop there. Now, the nearest CompUSA store is in El Paso, Texas; 1,200 miles from Berkeley. Nobody's going to drive 1,200 miles to redeem a gift card, and they know it! When the Trader Vic's restaurant closed in Bellevue, Washington last month; they announced that their gift cards were still valid, but the cards can now only be used at the Trader Vic's in Emeryville, California. How many people are going to drive 800 miles from Bellevue to Emeryville to eat a PuPu Platter? Restrictions. Still more gift cards go unredeemed because they had too many restrictions on them. American Airlines gift cards can't be used with travel agents, can't be used at airport ticket counters, and can't be used for flights originating outside the United States. Starbuck's says their gift cards "may be declined" at their branded locations in supermarkets, airports, and bookstores; and Starbuck's gift cards cannot be used to make purchases on their web site. American Express says that their gift cards are "good everywhere." Their slogan is: "Instead of one place, it's good all over the place." But in small print, it says: "Cannot be used for airlines, hotels, car rentals, telecom merchants,...."etc, etc. That doesn't sound like "everywhere" to me. Only buy gift cards that you know will get used. Before buying a gift card, ask yourself: "Will the recipient use this gift card?" If your answer is "I don't know," then buy something else. Don't buy gift cards from companies that are in trouble. A gift card is a loan from you to the issuing company. If that company goes bankrupt or leaves town before your card is redeemed, you're out of luck. Don't save gift cards. Spend them as soon as possible. Gift card issuers often claim that their cards are "just like cash", but that isn't true. Gift cards are definitely not just like cash. The United States government has never declared bankruptcy, and U.S. currency can be spent anywhere and has no expiration date. SHOPPING FOR CHEAP AIR FARES. The #1 mistake that people make when hunting for cheap air fares is confining their search to the big travel reservation sites: Expedia, Orbitz, Travelocity, etc. Not only are these sites almost always more expensive than buying tickets directly from an airline, but airlines often save their lowest fares and best deals for their own web sites. In 2002, most airlines stopped paying commissions. Since then, travel reservation web sites have been including transaction or booking fees into the prices of the tickets they sell. A good place to start your search for a cheap air fare is Kayak. Kayak doesn't sell tickets. They search other web sites for the best rates. However, some airlines don't cooperate with Kayak, most notably, Southwest Airlines. Southwest is, by far, the nation's largest discount airline, and 60% of all the flights taking off from Oakland Airport are Southwest's. Their fares are hard to beat. You can only buy Southwest tickets on Southwest's own web site, Southwest. One thing I especially like about Southwest's web site is the transparency. They show you all the fares to a destination, including flights that are sold out and rates that are no longer available, so you know why you are paying more. I don't know of any other airline that does that. And remember to buy electronic paperless tickets. Most airlines charge $10 to $20 extra to mail printed tickets to you. When I was a kid, I rarely got to eat expensive boxed chocolates. That changed when Zadie (grandfather) Goldberg moved into our house when I was a teenager. Zadie worked in a liquor store in Baltimore, and he brought home a lot of boxed chocolates, and they were all free! They were holiday chocolates, and Zadie got them after the holidays were over. Heart-shaped boxes of chocolates that say "Happy Valentine's Day" have little market value in March, which is when the owner of the liquor store gave them to Zadie. He also brought home Easter chocolates in May and Christmas chocolates in January. The best candy came after Valentine's Day. The worst came after Thanksgiving. 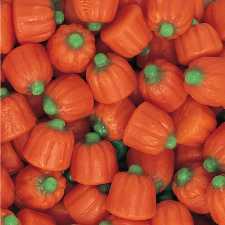 After Thanksgiving, Zadie brought home bags of "candy corn" and "mellocreme pumpkins." These candies are colorful, but flavorless and crumbly. You know, people spend a lot of time and money preparing their Thanksgiving dinners, trying to make sure that every dish is just perfect, but nearly all the candy made for Thanksgiving is lousy, and it always was. I wonder why that is. In September, English candy maker Cadbury announced that it was recalling all the chocolate made in its Beijing factory after it was found to contain high levels of melamine, an industrial chemical that has sickened over 50,000 Chinese children. Some children have died, but the government of China won't say how many. This recall does not affect Cadbury products made in the United States by Hershey. Cadbury products made in the U.S. do not contain ingredients from China. 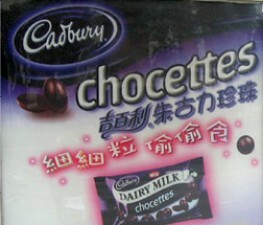 However, I have seen Chinese-made Cadbury chocolates in stores in Oakland's Chinatown. If in doubt, check the back of the wrapper to see where the candy was made. Ingesting melamine can cause a number of very serious medical problems, including complete kidney failure. Melamine has also been found in many other Chinese products, including White Rabbit brand candy (which has also been recalled), toothpaste, crackers, cookies, baby food, etc. This melamine poisoning was not an accident. This was a crime of greed. The government of China says that all over the country, melamine has been deliberately added to watered-down milk and low quality grain in order to fool lab tests by making these products appear richer in protein than they actually are. Toxic pet food from China. In 2007, hundreds of dogs and cats died in the U.S. after eating melamine-tainted pet food from China. This toxic pet food was recalled and sold for salvage. Later it was discovered that hog farmers across the U.S. were feeding their pigs the "salvaged" Chinese dog food, (which they got cheap), resulting in pork being sold in several states, including California, with melamine in it. (This story just keeps getting worse!) The California Department of Food and Agriculture has decided to allow the continued sale of melamine-laced pork as long as it is labeled "not for consumption." Frankly, I don't understand that. Why would people buy pork, if not to eat it? What other use does pork have? Is there some secret use for pork that I don't know about? I wonder what it could be. I once had a tenant who owned a Mercedes diesel that he modified to run on used french fry oil. Perhaps you could modify a car to run on lard, a sort of "Porkmobile", but I don't know. I'm just guessing. What do you do with pork that is "not for consumption"? I can't figure this one out. In case you were wondering: Berkeley Nut Company's sole supplier of chocolate and cocoa is the Guittard Chocolate Company. Their factory is located in Burlingame, California. I do not buy food ingredients from China, and I have recently changed the ingredient labeling on the back of my chocolate bars to show the place of origin of the nuts and fruit inside. My Cat Weighs 80 Pounds. Last year, I rented a condo on McAuley Street in Oakland. In the ad I placed on Craigs List, I said I would allow a cat, but not a dog. I didn't want a dog here because the sound of a dog barking can be heard through the walls. The first application I got was from a single guy who said he had a cat named "Muffin." I asked him: "Why are you moving?" He answered: "Muffin pulled the linoleum up off the kitchen floor in my apartment with his teeth and chewed it up, so my landlord is making me leave." I said: "Pulled the linoleum up off the floor? Just how big is your cat?" He said: "About 80 pounds." I said: "You have a cat that weighs 80 pounds?" He said: "Yeah, about that." I said: "I'd like to see this cat. Do you have a photo of your cat with you?" He said: "Yes." He opened his wallet, took out a photo and handed it to me. I looked at the photo and said: "This is a picture of you standing next to a dog. 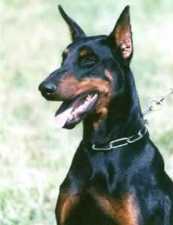 I think it's a Doberman." He said: "Yeah! That's Muffin!" I said: "I don't understand. You told me that you have a cat. You wrote the word 'cat' on your Application Form." He said: "Well, In your ad, you said you would allow a cat, but not a dog." I said: "Oh, I get it. You thought that if you called your dog a cat, then it would legally be a cat." He said: "Well, something like that." I decided to reject this application. I once had a tenant with a dog like Muffin living in a house I owned on Canning Street. That dog also pulled the linoleum up off the kitchen floor - and ate it! After rejecting Muffin, I rented my condo to a young couple with a real cat named Ciao.